A Guest Editorial THREE centuries ago, Francis Bacon tried the world's first experiment in the popularization of science. 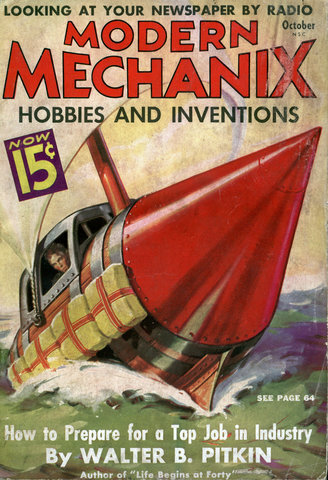 He spun a yarn, "The New Atlantis," an account of the inventions some shipwrecked sailors found on an imaginary island. 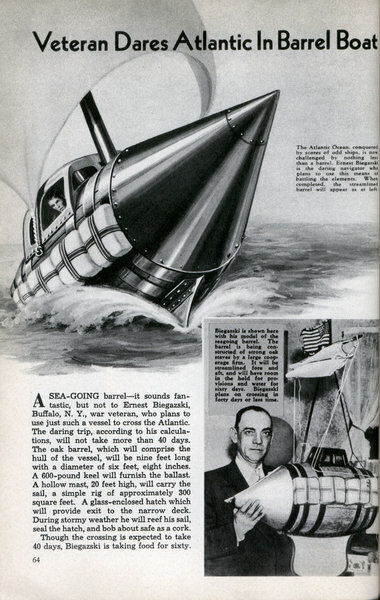 Bacon thought it would be a grand novelty to have folks travel in carriages without horses, sail without sails, and go under water; fly somewhat like birds, be cured by salt baths, and drink sea water from which the salt had been filtered. Most of these " dreams have since come true. 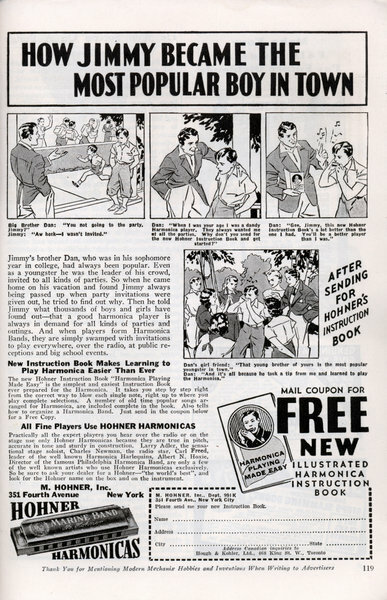 PLAYING the banjo for an itinerant medicine man might not be considered the ideal preparation for a career as a cartoonist, but that is the unconventional path to comic strip fame followed by Harry Tuthill, creator of the famous Bungle Family. Tuthill actually bungled into fame, if we may be granted a play on words which is the license of every cartoonist. 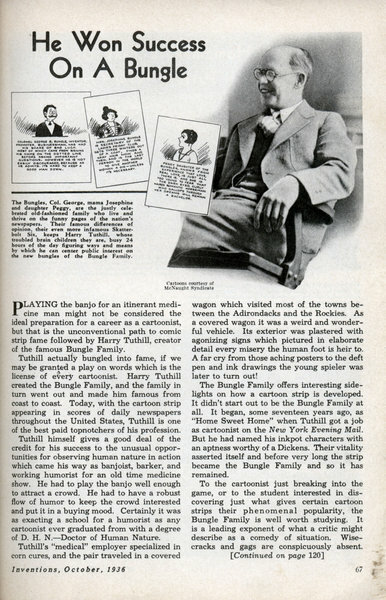 Harry Tuthill created the Bungle Family, and the family in turn went out and made him famous from coast to coast. 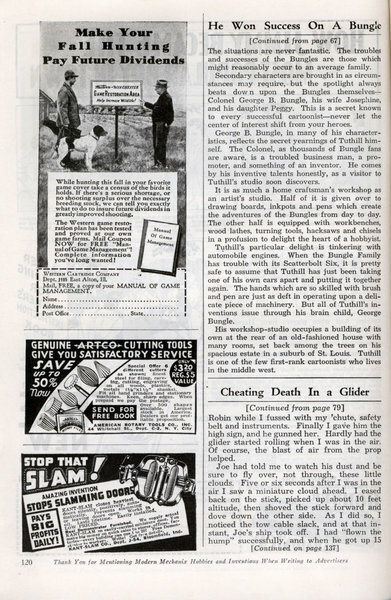 Today, with the cartoon strip appearing in scores of daily newspapers throughout the United States, Tuthill is one of the best paid topnotchers of his profession. 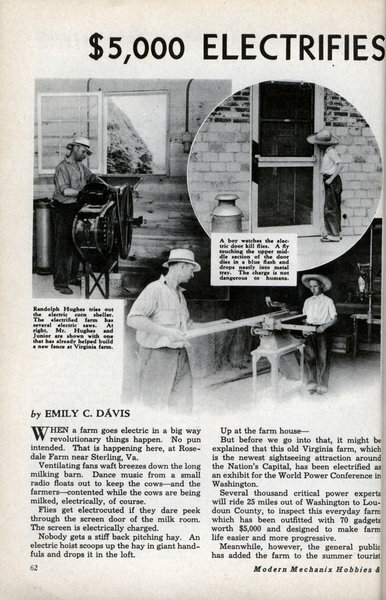 by EMILY C. DAVIS WHEN a farm goes electric in a big way revolutionary things happen. No pun intended. That is happening here, at Rose-dale Farm near Sterling, Va. Ventilating fans waft breezes down the long milking barn. 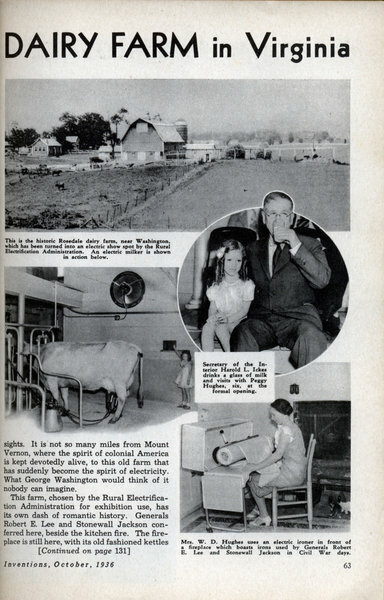 Dance music from a small radio floats out to keep the cows—and the farmers—contented while the cows are being milked, electrically, of course. Jimmy's brother Dan, who was in his sophomore year in college, had always been popular. 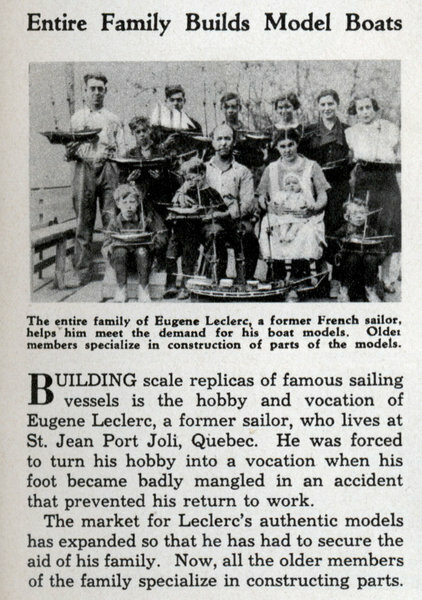 Even as a youngster he was the leader of his crowd, invited to all kinds of parties. So when he came home on his vacation and found Jimmy always being passed up when party invitations were given out, he tried to find out why. Keep that Healthy TAN That Men and Women Admire! Keep that Healthy TAN That Men and Women Admire! THERE is no need to lose that Tarzan Tan just because cool days are coming and you no longer can get out into the sunshine in a bathing suit! You can keep that tan and get even more if you wish it, right in the privacy of your own room! Just a few minutes a day under a Health Ray Sun Lamp and your friends will think you spend your week-ends in Palm Beach! 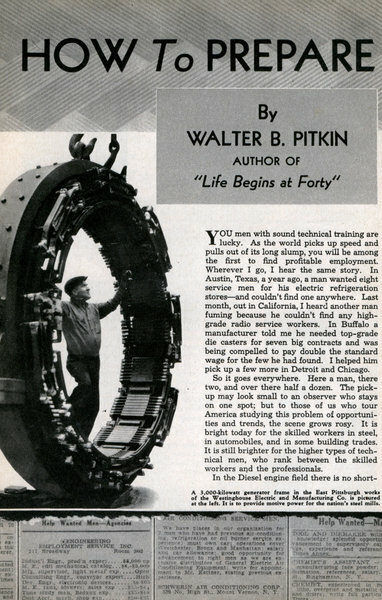 By WALTER B. PITKIN AUTHOR OF "Life Begins at Forty" YOU men with sound technical training are lucky. As the world picks up speed and pulls out of its long slump, you will be among the first to find profitable employment. Wherever I go, I hear the same story. In Austin, Texas, a year ago, a man wanted eight service men for his electric refrigeration stores—and couldn't find one anywhere. Last month, out in California, I heard another man fuming because he couldn't find any high-grade radio service workers. 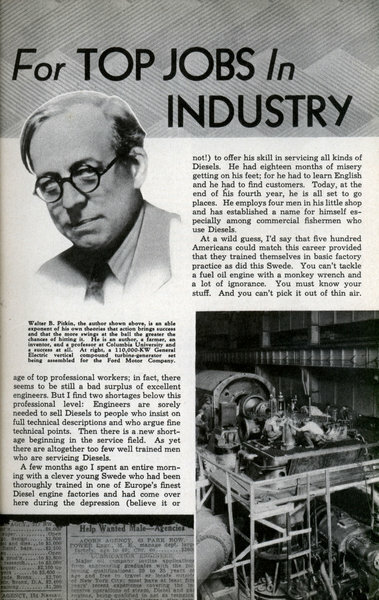 In Buffalo a manufacturer told me he needed top-grade die casters for seven big contracts and was being compelled to pay double the standard wage for the few he had found. I helped him pick up a few more in Detroit and Chicago. Miss Henrieite Swope, daughter of Gerard Swope, it pictured at Ak-Bulak, U. S. S. R., where she viewed the recent solar eclipse. Dr. Maud Slye of the University of Chicago, above, soon will publish her conclusions regarding the inheritance of cancer based upon the breeding of 130,000 mice in the past 25 years. 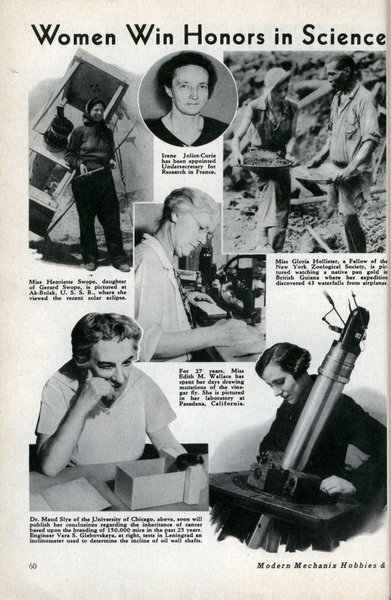 Engineer Vera S. Glebovskaya, at right, tests in Leningrad an inclinometer used to determine the incline of oil well shafts. 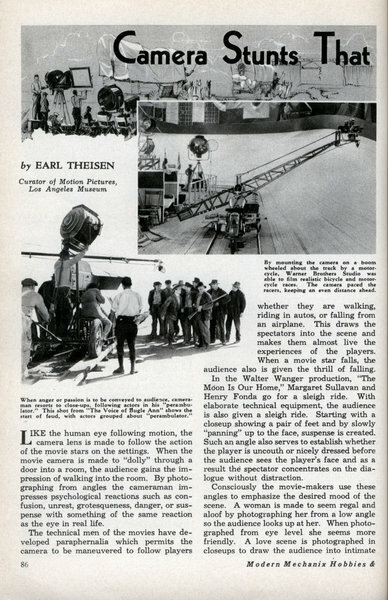 by EARL THEISEN Curator of Motion Pictures, Los Angeles Museum LIKE the human eye following motion, the camera lens is made to follow the action of the movie stars on the settings. 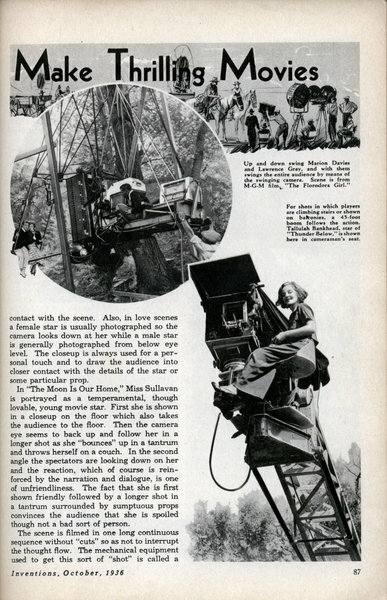 When the movie camera is made to "dolly" through a door into a room, the audience gains the impression of walking into the room. By photographing from angles the cameraman impresses psychological reactions such as confusion, unrest, grotesqueness, danger, or suspense with something of the same reaction as the eye in real life. 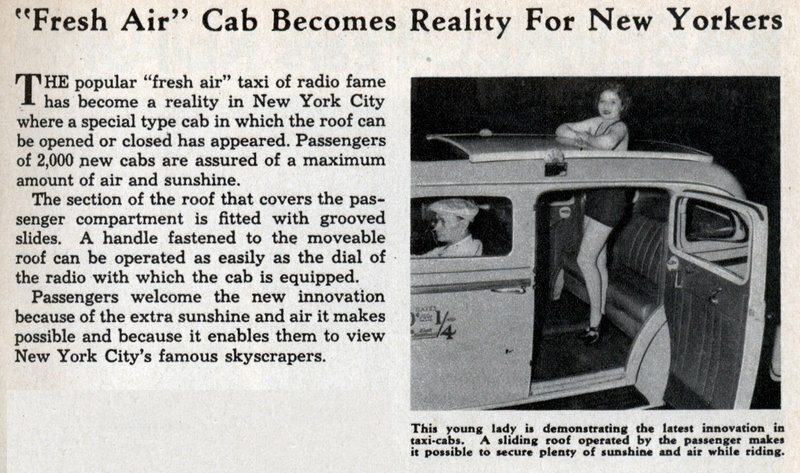 THE popular "fresh air" taxi of radio fame has become a reality in New York City where a special type cab in which the roof can be opened or closed has appeared. Passengers of 2,000 new cabs are assured of a maximum amount of air and sunshine. The section of the roof that covers the passenger compartment is fitted with grooved slides. 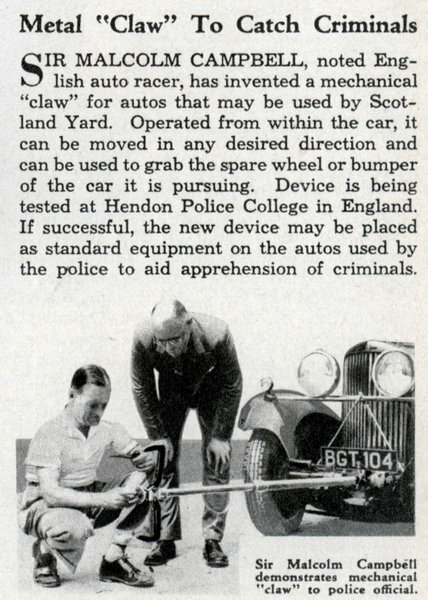 A handle fastened to the moveable roof can be operated as easily as the dial of the radio with which the cab is equipped. 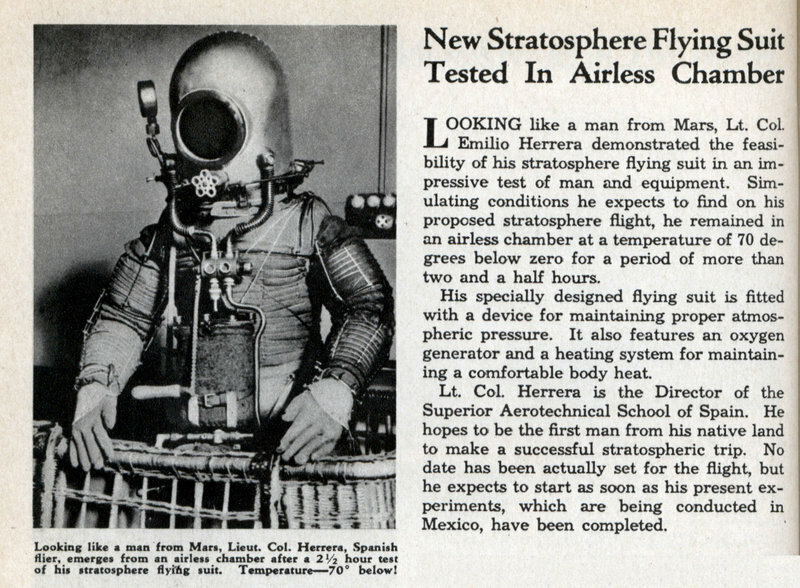 LOOKING like a man from Mars, Lt. Col. Emilio Herrera demonstrated the feasibility of his stratosphere flying suit in an impressive test of man and equipment. Simulating conditions he expects to find on his proposed stratosphere flight, he remained in an airless chamber at a temperature of 70 degrees below zero for a period of more than two and a half hours. A SIX-MILE trip through deadly gases in the North Outfall sewer in Los Angeles, Calif., was made by Rufus Brown, assistant superintendent of sewers. The hazardous trip was made to determine the condition of the tunnel walls which had been exposed to the sewer's powerful erosive gases since 1922. 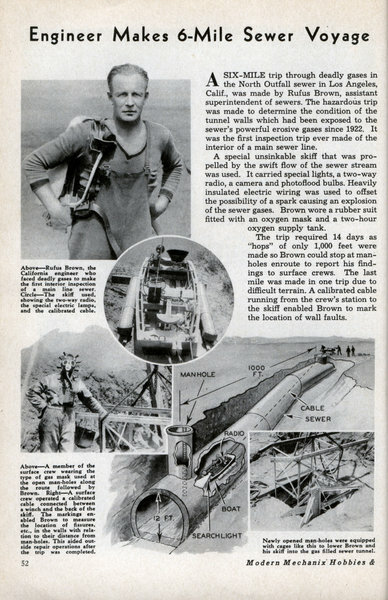 It was the first inspection trip ever made of the interior of a main sewer line. A special unsinkable skiff that was propelled by the swift flow of the sewer stream was used. 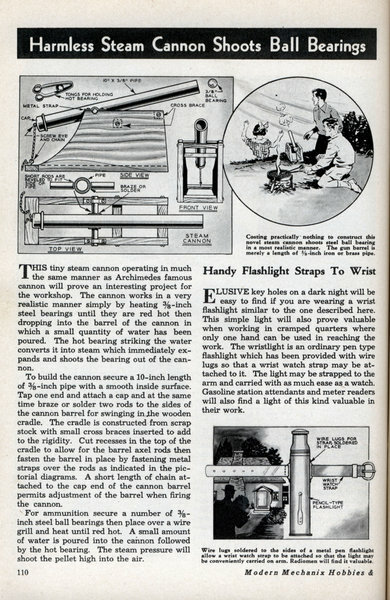 It carried special lights, a two-way radio, a camera and photoflood bulbs. 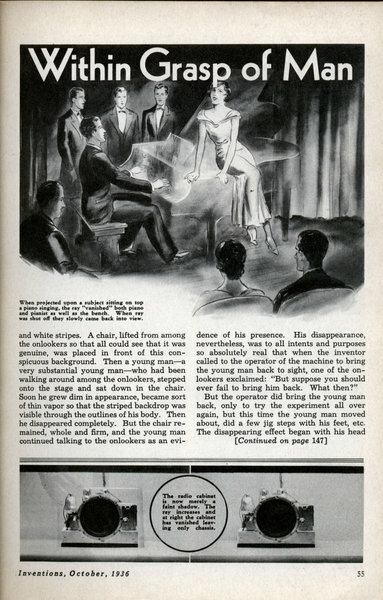 Heavily insulated electric wiring was used to offset the possibility of a spark causing an explosion of the sewer gases. Brown wore a rubber suit fitted with an oxygen mask and a two-hour oxygen supply tank. by A.L. White Two Hungarian scientists solve age-old quest with devices worthy of Arabian nights wizards. SUPPOSE that out onto a stage come eight chorus girls performing an intricate dance. Gradually something seems to happen, the heads, faces, and upper parts of the bodies of the girls seem to be disappearing. 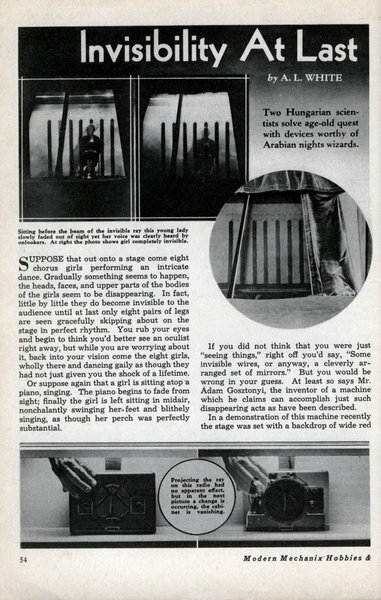 In fact, little by little they do become invisible to the audience until at last only eight pairs of legs are seen gracefully skipping about on the stage in perfect rhythm. You rub your eyes and begin to think you'd better see an oculist right away, but while you are worrying about it, back into your vision come the eight girls, wholly there and dancing gaily as though they had not just given you the shock of a lifetime. Or suppose again that a girl is sitting atop a piano, singing. The piano begins to fade from sight; finally the girl is left sitting in midair, nonchalantly swinging her feet and blithely singing, as though her perch was perfectly substantial. I guess that’s one route to keypad dialing. “Key Caller” Speeds Phone Service MAKING telephone number connections three times faster than can be done with an ordinary dial device is the work accomplished by a recent London invention. 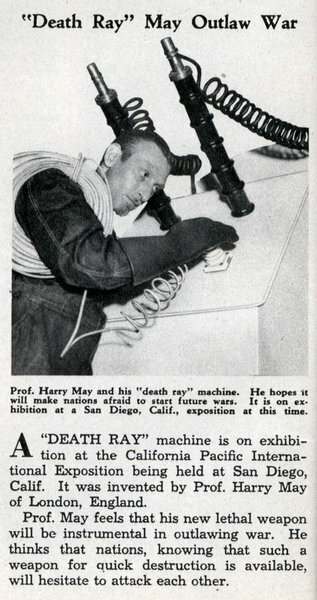 The “key caller,” as machine is called, consists of an instrument resembling a small typewriter. 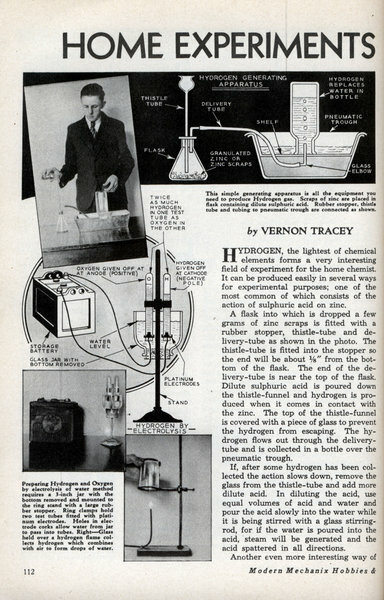 by VERNON TRACEY HYDROGEN, the lightest of chemical elements forms a very interesting field of experiment for the home chemist. 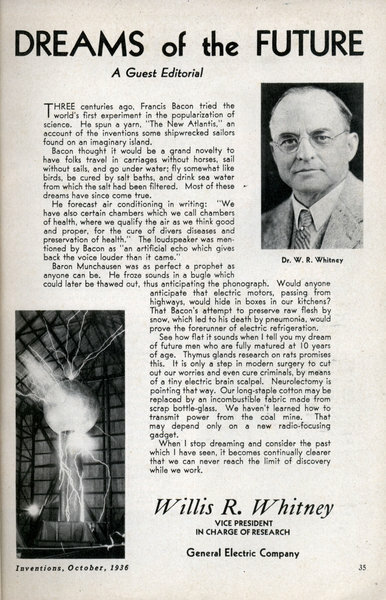 It can be produced easily in several ways for experimental purposes; one of the most common of which consists of the action of sulphuric acid on zinc. A flask into which is dropped a few grams of zinc scraps is fitted with a rubber stopper, thistle-tube and delivery-tube as shown in the photo. The thistle-tube is fitted into the stopper so the end will be about 1/8" from the bottom of the flask. The end of the delivery-tube is near the top of the flask. Dilute sulphuric acid is poured down the thistle-funnel and hydrogen is produced when it comes in contact with the zinc. The top of the thistle-funnel is covered with a piece of glass to prevent the hydrogen from escaping. 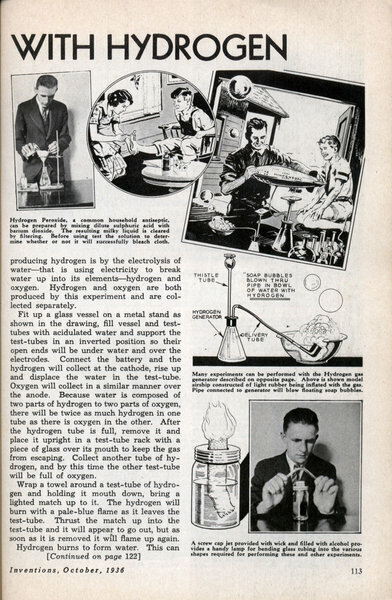 The hydrogen flows out through the delivery-tube and is collected in a bottle over the pneumatic trough. 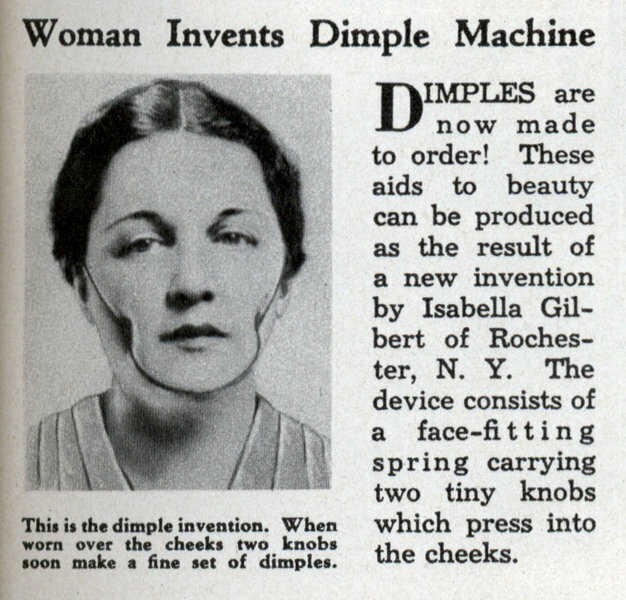 Woman Invents Dimple Machine DIMPLES are now made to order! These aids to beauty can be produced as the result of a new invention by Isabella Gilbert of Rochester, N. Y. 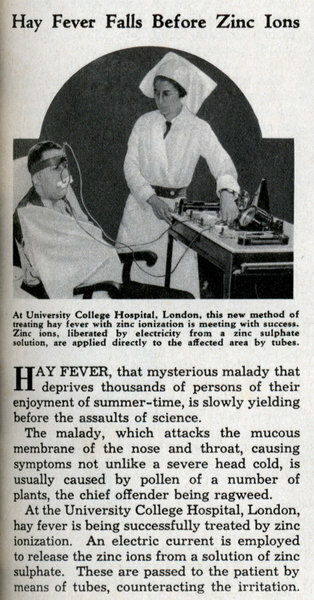 The device consists of a face-fitting spring carrying two tiny knobs which press into the cheeks.